One of the best tools for measuring social media activity is right in front of you, and it’s free: Google Analytics. If you don’t have it set up to monitor your website, you’re missing out on extensive and easy-to-catch data that can help you optimize your PR campaigns on social media. As Instagram’s numbers have grown, so, too, has the presence of brands looking to connect with consumers on the photo-sharing platform. Appreciating the value of Instagram’s user base is easy. Creating an account that is authentic, relevant and engaging—that’s a little harder. Your organization has just been hit with a cyber security breach. Now, it needs to focus on the steps necessary to rebuild, redirecting company focus and becoming more effective at dealing with these types of issues. Your company’s blog is live. You’re drafting content for social media networks on a regular basis. You’ve recently sent out a press release announcing your latest company milestone. But are you optimizing all this amazing content for all it’s worth? For those seeking employment in professional communications, the in-person interview is the most critical part of the job search process. Nailing an interview takes practice, and it also helps to know some of the types of questions or tasks you’ll be asked to do. The struggle to understand and abate the human-induced impact on the climate has always unfolded with divisiveness, and the Clean Power Plan promises to be no different. Let’s take a look at how five big brands that support the plan communicate about the topic. On Wednesday, Brady took to Facebook, issuing a 500-word statement responding to allegations that he destroyed potential Deflategate evidence. Let’s take a look at four specific lessons PR pros can learn from his latest reputation management move. 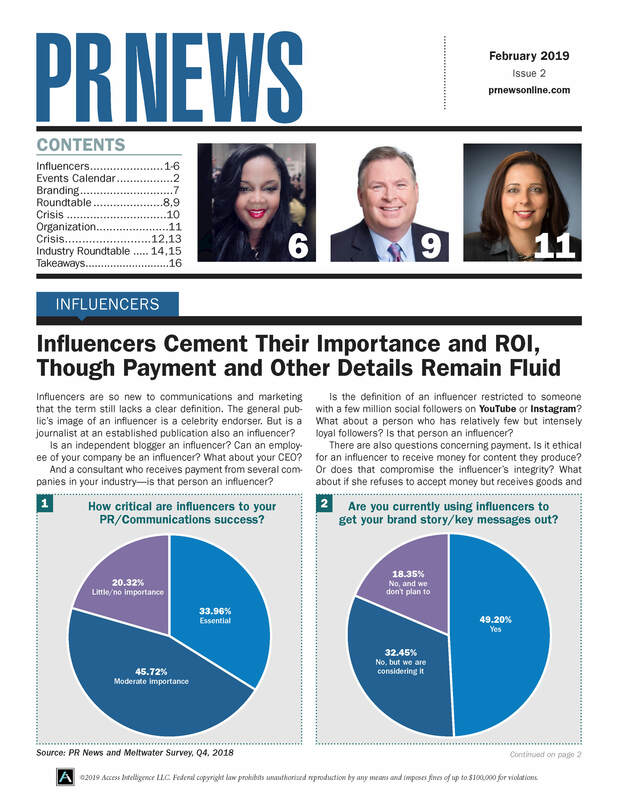 PR News Survey: Where Does PR Stand on Paid Social Media? Ahead of PR News’ upcoming Big 4 Social Media Conference, we surveyed the our community with the goal of finding out where PR stands on paid social media. Science tells us that we absorb information easier when it’s presented visually than when it’s presented in text-heavy formats. At the same time, we’re predisposed to favor linear, coherent stories. When combined, these elemental ideas give visual storytelling its attention-grabbing power. Facebook page owners now have the ability to restrict the audience of videos by age and gender, set expiration dates for videos, label videos based on interest categories and make “secret” videos that are accessible only via a direct URL, among other new features.